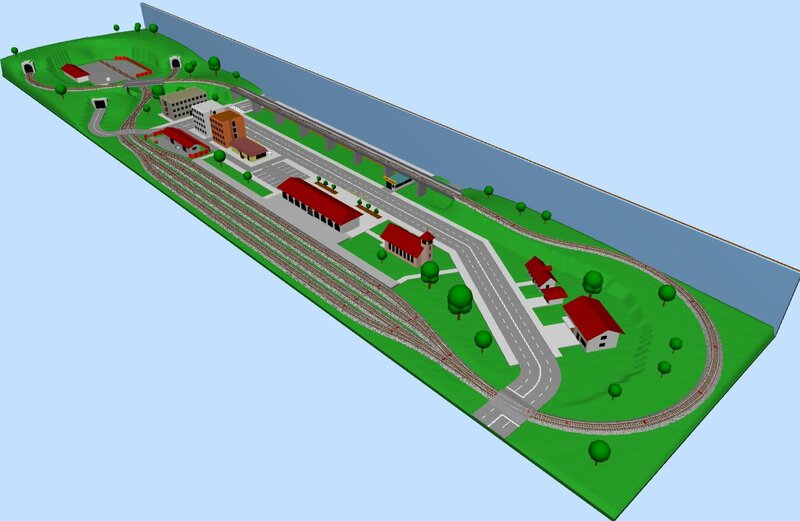 SCARM means Simple Computer Aided Railway Modeller – a free software for simplified design of scaled railway layouts and creation of railroad model track plans. With SCARM you can easily create your desired layout – just download the installation package and start editing your first track plan. A short description concerning use of the program in its current stage of development is following below. Post your questions, remarks, reviews or critics about SCARM in official Facebook page or by e-mail at . Check also the recently released SCARM Blog where you will find additional information, news & updates, tips & tricks, tutorials & examples, advanced stuff and more about using of the program. What SCARM is able to do? Why in general to use SCARM? Changes in the documentation, new track libraries and latest version of SCARM are located at www.scarm.info. Latest information about the development and knowledge aboud using of the program are available in the SCARM Blog. After installing, start the program and select your preferred language from "View" > "Language" menu. 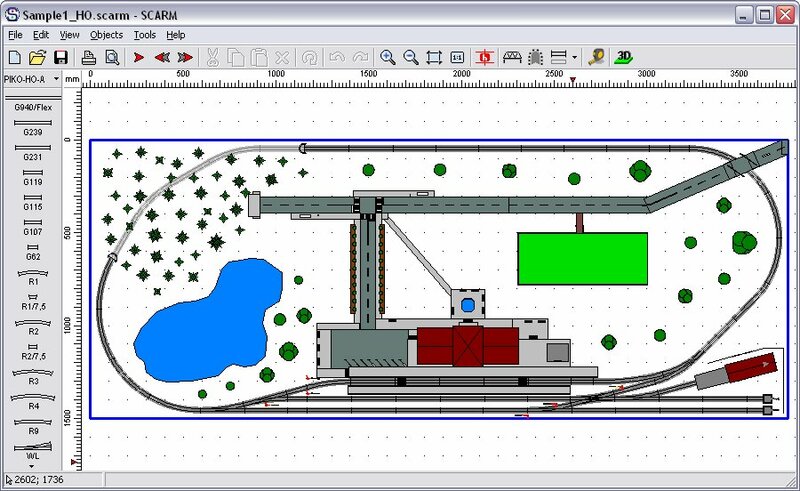 See more model train layout examples and track plans, created in SCARM at Railroad layouts and design ideas section in the blog. 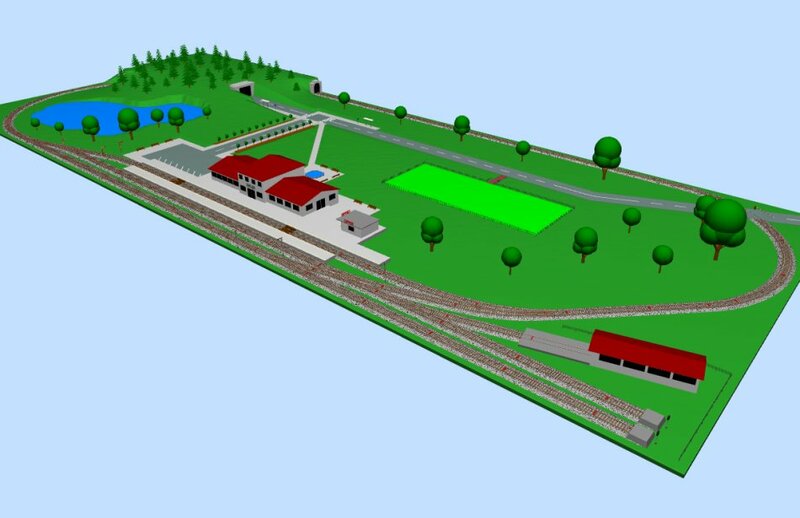 Check also the recently released online database for Free Railway Layouts & Railroad Track Plans, created in SCARM. If your language is missing, but you know some of the other build-in languages, you may translate SCARM user interface using "Tools" > "Translation Wizard" menu and send translation file to the author at for integrating into installation package. - New options in "Settings"
- 2D/3D figures and shapes for creating buildings, platforms, roads, etc. * Some of the libraries are not fully completed. Data accuracy is not guaranteed. More libraries will come soon. For example, you can begin with a simple oval: Start the program (scarm.exe) and select "Edit" > "New start point" from main menu. Click with left mouse button to place the start point on the plot. "Tillig-TT-Std" library is selected by default. Select straight #6110 track from the left vertical panel (using left mouse button). Then select a curved #6210 track in the same way - additional buttons for direction will appear - choose desired turn direction with clicking one of them. To repeat the curved track, press Spacebar 3 times until semicircle is formed on the plot. If some tracks go outside of the visible plot area, use the mouse wheel to rescale the drawing or press it to move the drawing area in desired direction. Then place track #6110 again followed by 4 curved #6210 tracks and your first oval is ready. The track ends will be connected to each other automatically, because their ends will overlap at the same point. Watch also the SCARM Video Tutorials series if you are a beginner in SCARM and want to start faster and easier. What else can I do with SCARM? You can create complex layouts with many train stations on bigger area. You can modelling flex-track routes easily, intuitive and most important – in very realistic way. 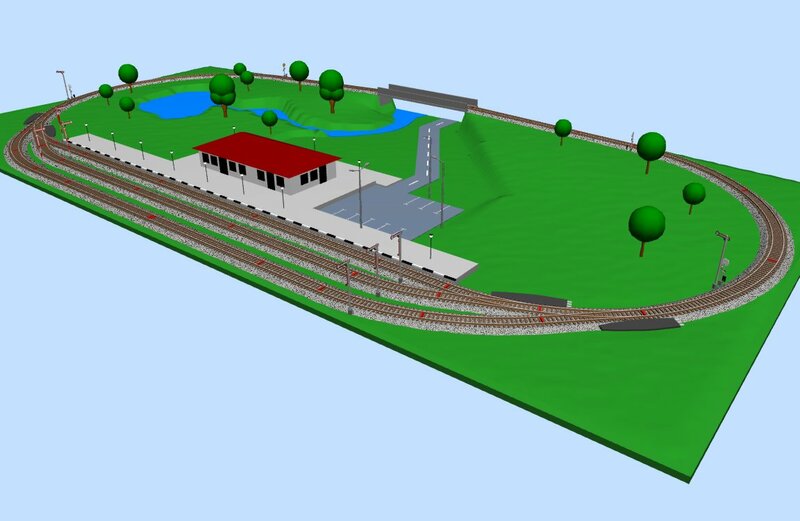 You can deploy your layout on more than one level, with different heights and slopes of choosen sections from the track route. You can use tunnels and bridges. 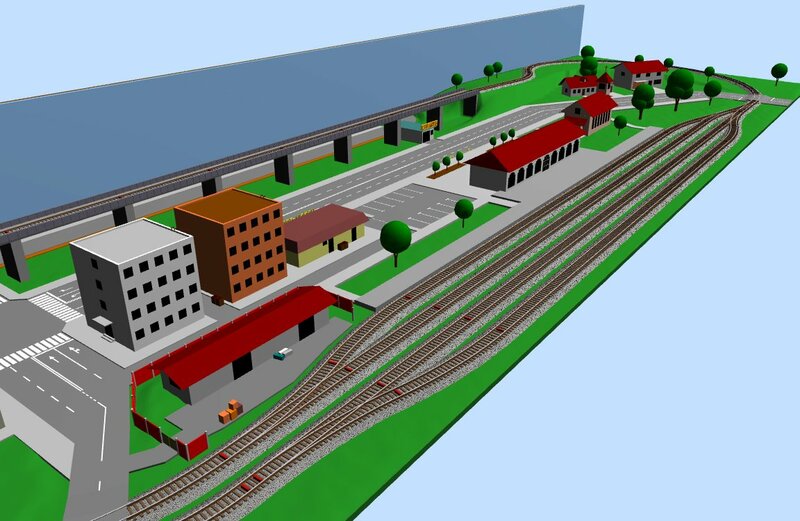 You can draw figures in order to create buildings of train stations, houses, industries, etc. together with all needed roads and infrastructure. You can use semaphores and color light signals to create the signalling in the layout track route. You can see a 3D view of your layout - just select "3D" button from the toolbar. You can measure distances and track sections length, using the functions in "Tools" menu. 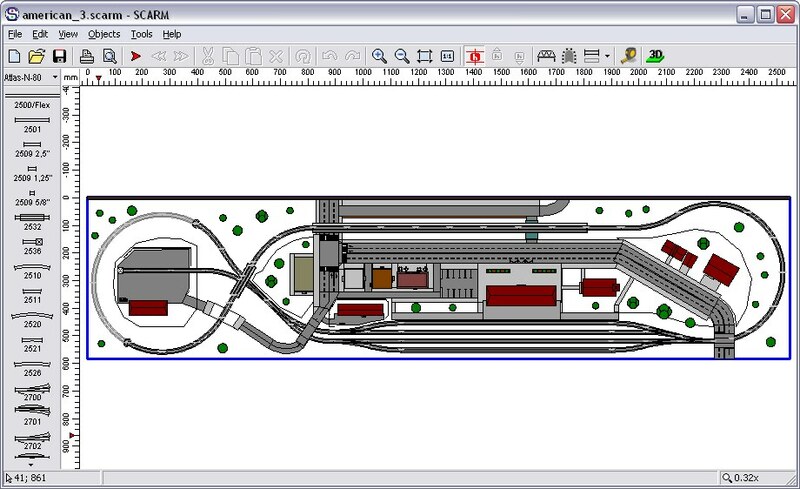 You can export and/or print your layout and show it to the other model trains fans and enthusiasts. You can view and print a list with the needed track pieces and even use it as a shopping list. You can share your ideas with the author and ask him for new features and also for correcting bugs and errors, if you find some. How to select a section? How to move or turn a section? How to check size and area of the layout? Where are the scrollbars?! - There are no scrollbars. To move the plot, press the mouse wheel and drag the plot in desired direction or use the arrow keys. How does Copy-Paste works? - It works as usual, like in most vector graph editors. Tracks, placed from clipboard appeared over those that were copied. After Paste, you can move the tracks where you want on the plot. How to move the tracks? - Hold Ctrl and drag selected tracks with left mouse button or use "Move" command from the context menu. How to disconnect and connect the tracks? - This is done automatically when tracks are moved. Disconnecting: select track or track section, hold Ctrl and drag it away with left mouse button. Connecting: select track or track section, hold Ctrl and drag it with left mouse button to another track, thus track ends overlap each other. When overlapping occurs, arrows at track ends will colour in red and green - release mouse button and tracks will be connected automatically. How to rotate tracks? - If you want to place new track, rotated by given angle (or rotate existing track on the plot), place new Start point at desired direction and then place the track (or move the existing track) in that point. If you want to invert the track, you can do this by disconnecting it and connecting again from the opposite side (see previous answer for details). How to select a section? - Section of tracks is every independent route on the plot. Select track or free point from the section and select "Edit" > "Select section" from menu bar. Or just double click with the left mouse button over desired section. How to move or turn a section? - You can move or turn a section like a move or turn of single track (see above). How to zoom? - Use "View" > "Scale" from the menu or "+" and "-" from keyboard numpad or just use mouse wheel. How to work with flex-tracks? - Flex-tracks has maximum length and minimum radius of curve by default. You can modelling your flex route with many straight and curved sections within, but single flex-track cannot be longer than max length and cannot be curved more than min curve radius. If you want to build longer flexible route, use Spacebar to add new flex-track, after finishing with modelling of the last one. 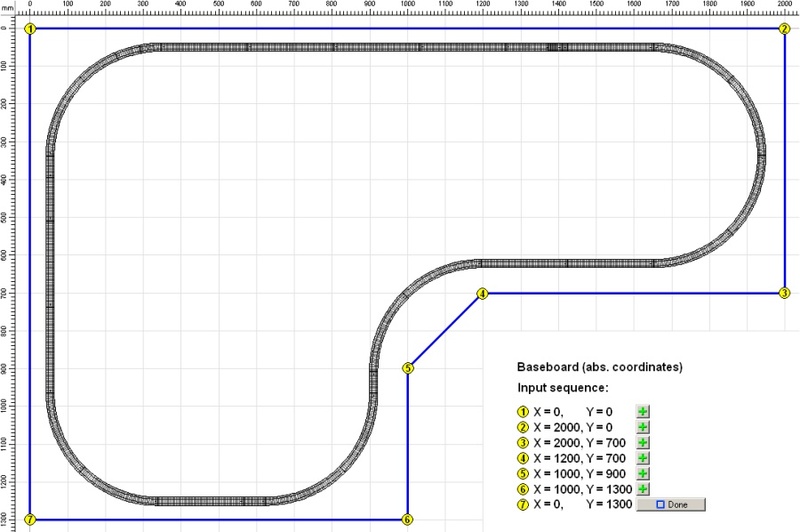 Select desired flex-track from left panel - a straight grey rail will appear on the plot with max possible length. Use mouse to form a curvature and length of the first section - it will be drawn in black and the remaining part will be drawn in grey. Click left mouse button to fix the section and to continue with remaining part. Click right mouse button to fix the section and to "cut" the remaining part. If you dislike the last fixed section, you can delete it using Backspace. If you want to cancel the modelling, press Esc. 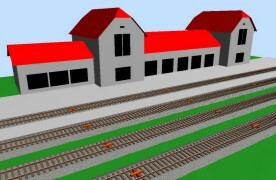 If you want to connect the flex-track to other track in the layout, point the grey remaining part in the direction of that track endpoint, so both tracks to overlap each other - when directions became identical, the arrow of the flex-track will be colored in green - click left mouse button to connect the tracks. For precise shaping with parameters like length or radius and angle of the flex-sections, see the "Flex-tracks modelling" function in the Toolbox. How to place tunnels and bridges? - Use buttons "Tunnel" or "Bridge" from the toolbar. Next placed track will be drawn as in tunnel or over bridge, depending on selected mode. If you want to change some part of the track route, select it first and then select your preferred mode. How to set heights and slopes? 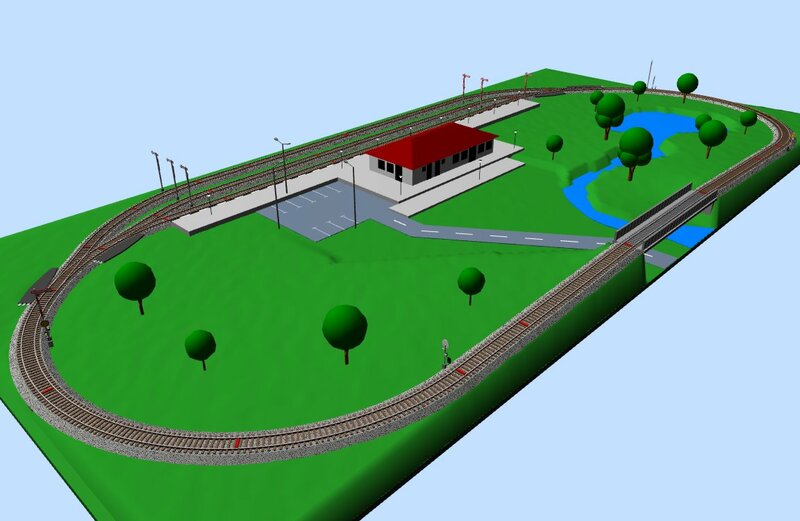 - Setting of heights and slopes allows deploying of layout track route in more than one level. To start doing this, toggle "View" > "Show Track Heights" from the menu. The heights will be drawn at track ends and their initial values will be zeroes in selected measurement unit. To change the height (or the slope) of given track (or track section), first of all the tracks (or section) must be selected and then you will be able to select desired height with left mouse button. You cannot directly select and change heights of tracks, which are not selected. 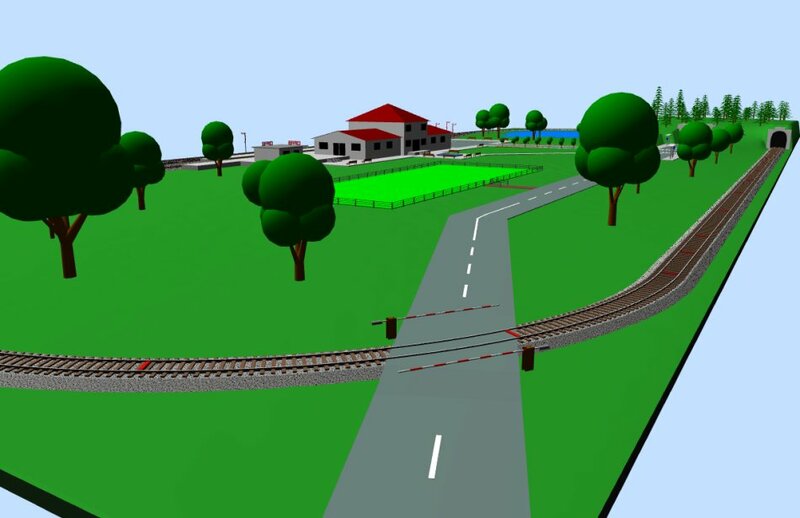 All type of tracks can have different heights, but only straights, curves and flex-tracks can form slopes, because only they can have independent heights on both ends. To set same heights for all tracks in the selected track section, select any height from it, set the desired height level and press Enter. 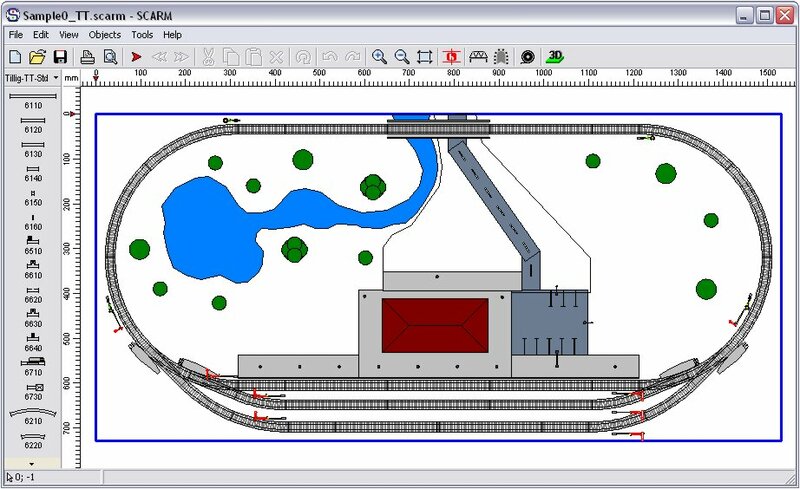 Use 3D Viewer in order to see the different heights in the layout – the program will automatically place required supports under tracks with heights greater than zero. Note: Starting from version 0.8.4, the gradients will be shown in percents by default. The setting is located in "Tools" > "Settings..." > "Dimensions" tab > "Gradients", where you can select between Percents (%) and Thousands (‰). The proportion "percents/thousands" is 1:10, so 1% = 10‰. How to set track supports? - You can change or remove track supports in the selected section or at selected height, using commands from "Edit" > "Track Supports" menu. Changes are reflected only in 3D viewing mode. How to create helix? - Helix in the track route is using when there is need to get over a big height, which is unable to be realized with simple incline. 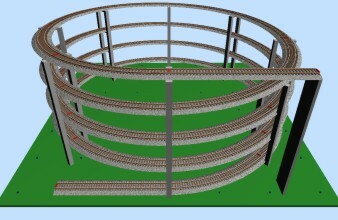 It can be created with several rotations by connecting same curved tracks together and last point from the last track is lifted to the desired height. Before you start, check that heights are enabled and are visible on the screen – if not, toggle "View" > "Show Track Heights". Select free point from already existing track in the route and add first curved track of the helix there. Press Spacebar several times until full circle is formed. Select tracks in the circle, then select the height at the last free point from the last placed curved track and change the height, so maximum gradient reaches 4% - this will show you maximum height than can be get over with single rotation of the helix. Knowing this value and target height that you want to reach, you will be able to get approximate count of rotations, needed for the climb. Make these rotations (with Spacebar again), select the circle (always with selection rectangle), select the height in the exit helix point and form the final gradient and height of the helix. Gradient values bigger than 4% are undesirable, because locos will be heavily loaded when climbing, especially with longer trains. Gradient values lower than 3% may be not suitable due to helix support construction or using of catenary. Add last exit track, then set track supports to Arch type (using "Edit" > "Track Supports" menu with still selected circle) for realistic look. You can see the helix in the 3D Viewer and then make corrections in the height or rotations (by adding or removing curved tracks). Note: At the moment there is no sense to Copy and Paste helixes, because when copied helix is joined to another part of the route, the heights of the tracks inside will be equalized and helix effect will be lost. How to use the Measuring tape? - Tape measure is a tool for measuring distances on the drawing plot. To use Measuring tape, you must activate it from "Tools" > "Measuring tape" menu. Click with left mouse button in the first point of measurement and drag the distance circle, until it reaches the second point of measurement. The distance is displayed in the Status bar. To turn off Measuring tape mode, press Esc. How to set direction angle of the start point? - Hold the left mouse button while placing the start point, move the mouse in the desired direction and release the button when ready. See also "Start point" function in the Toolbox. How to create baseboard? - Select "Edit" > "Create Baseboard" from the menu and draw the shape of the baseboard with left mouse button. When you are ready to place the last point, use right mouse button to close the shape. If you want to work with exact horizontal or vertical lines, hold Ctrl while modelling the shape (for rectangular figures). Actually, the baseboard’s shape can be any geometric figure with the only limitation that sides cannot cross each other. If you want to change the shape of the baseboard, you can either edit it or recreate it, using old shape as base for the new figure. Editing is done by control points at shape ends, which can be moved, inserted or deleted. If you want to create rectangular baseboard around the existing layout route, hold Shift while selecting "Create Baseboard" command. You can also create your baseboard by entering the coordinates of the sides, using dedicated functions in the Toolbox. How to work with figures in SCARM? - The figures in SCARM are used for creating 2D shapes on the drawing plot, which then automatically becomes 3D objects, by adding vertical position and height. 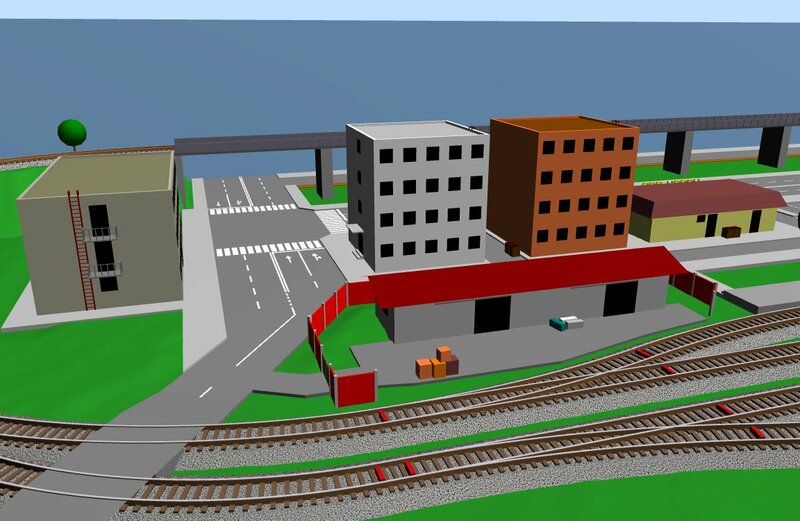 With help of the figures you will be able to create buildings, station platforms, railroad facilities, railway-related equipment, layout installation and controlling stuff and even interior of the room where your layout will be located. To start your work with figures in SCARM, open the library selection menu (by right click over the name of currently selected library, located on top of the tracks selection panel) and then select "Figures" (at the bottom in the list). Available figure types will be displayed in the panel. Selection mode (first button) is activated by default. Vertical position – this is the distance from baseboard (ground zero) to bottom of the 3D object. Height – this is the height of the 3D object. If the value is zero, then the object will be invisible in the 3D viewing mode (useful for marking regions and specific areas in the layout, which are visible only in 2D mode). Color – this is the color of the object. Click over the white bar to choose the desired color from Windows palette. If you click on the small button, located right from the bar, the figure will became transparent – can be useful in some situations. 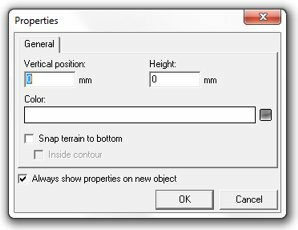 Snap terrain to bottom – if checked, the terrain under the shape in 3D mode will be snapped to bottom of the object. If not checked, the object fill be "floating" (i.e. roof over station platform). Inside contour - valid only when upper field has checkmark – if checked, the terrain will be snapped only inside figure contour (i.e. for creating banks of rivers and lakes). If not checked, the terrain snapping will spread outside figure contour (i.e. for buildings). Click "3D" button from the toolbar in order to see the figure in the 3D Viewer. You can change the properties later, by selecting the figure and opening the Properties window form "Objects" > "Properties" menu. You can set the properties of several objects at same time – just select them with selection rectangle or by mouse, while holding Shift key. To alter the form of already created figure, click with mouse over it and edit the control points. You can insert new points by right clicking over desired figure’s side and choosing “Insert new point” from the context menu. If you want to move some control point, select it and drag with left mouse button to desired position, but if you want to remove it, select the point and press Del key. You can group several figures together and work with them as single object – just select the figures and then activate "Objects" > "Group" menu. To move an object, first select it, then hold Ctrl and move it with mouse or use "Move" command from context menu. To rotate given object at a different angle, use "Objects" > "Rotate" menu and set the angle in the Rotation window by using of the horizontal slider. To align several figures horizontally or vertically, use "Objects" > "Align" and adjust the buttons in Alignment window. 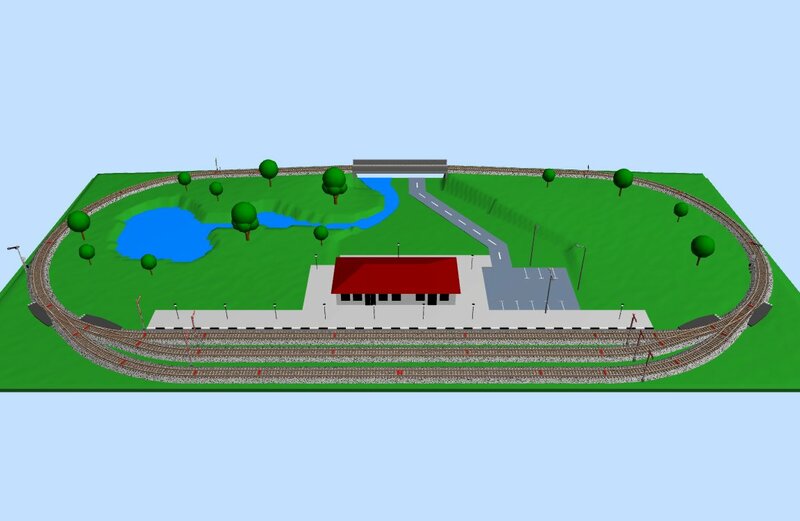 How to create station platforms? - Enable figures in selection panel (last position in libraries list menu). 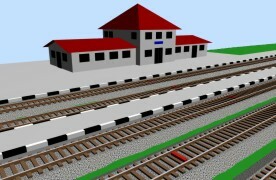 Select "Rectangle" and draw the platform between the tracks. Enter the height and the color in the Properties window and also vertical position, if the tracks have elevation different than zero. If the tracks are not exactly horizontal or vertical, you can turn the figure by necessary angle, using "Objects" > "Rotate" menu. 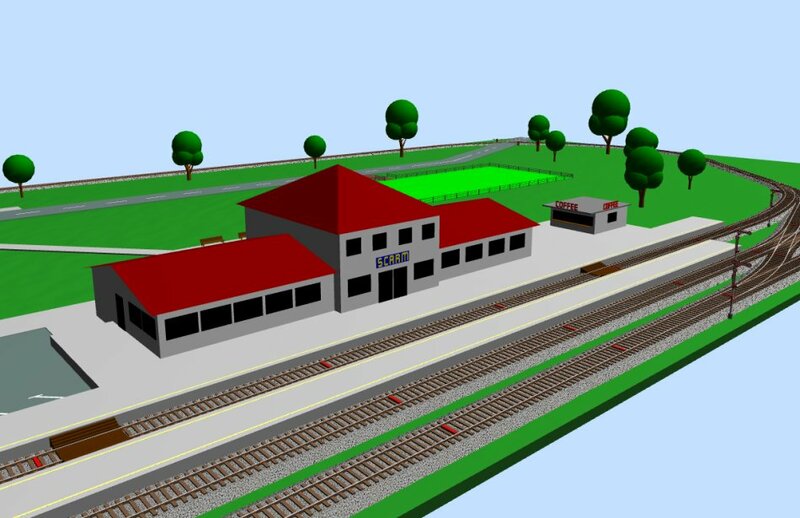 If the tracks are not straight or if they are forming some angle between them, you can use polygon to create more complex station platform. How to create houses and buildings? - It is easy – you just need to know the necessary height, according to number of the floors. 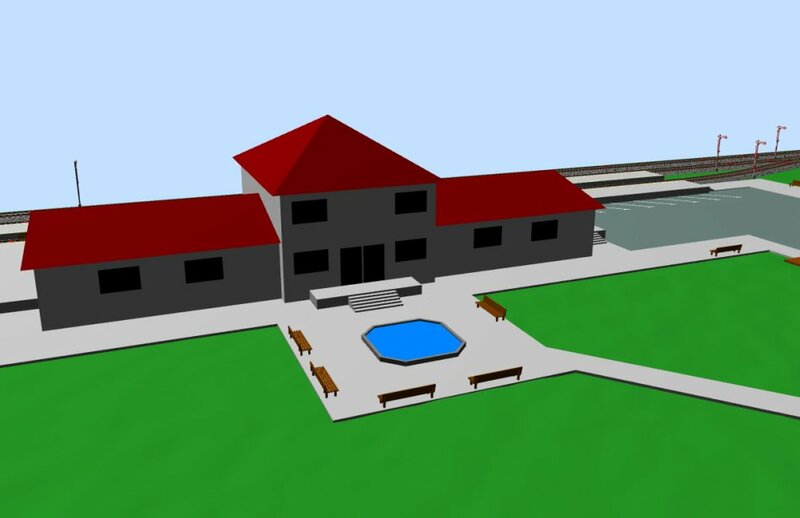 In the example below, a small single-floor house will be created. If the model building has bigger floor height or if your scale is not listed in the table, you can calculate the needed scaled height by the formula Real height / Scale. After height calculation, enter it, set remaining fields in the Properties window (if needed) and close the window. Select the rectangle (by clicking with mouse over it) and select "Roof" figure button from selection panel. 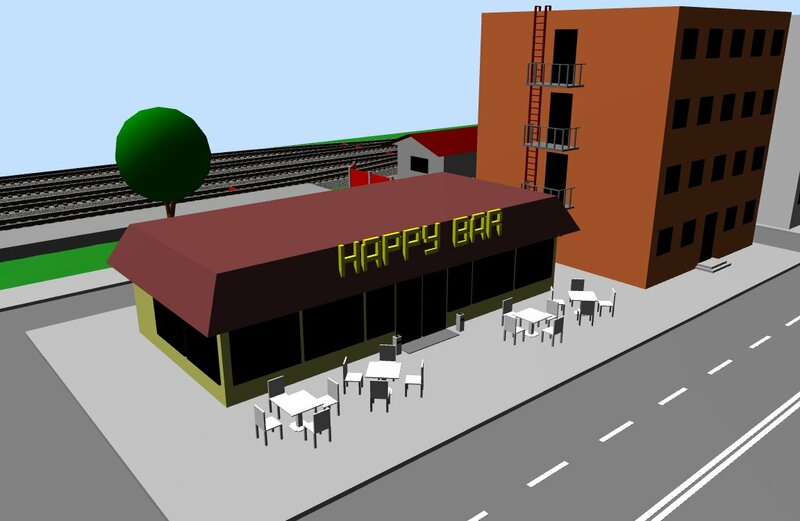 Select the roof type and your first building created in SCARM is ready. 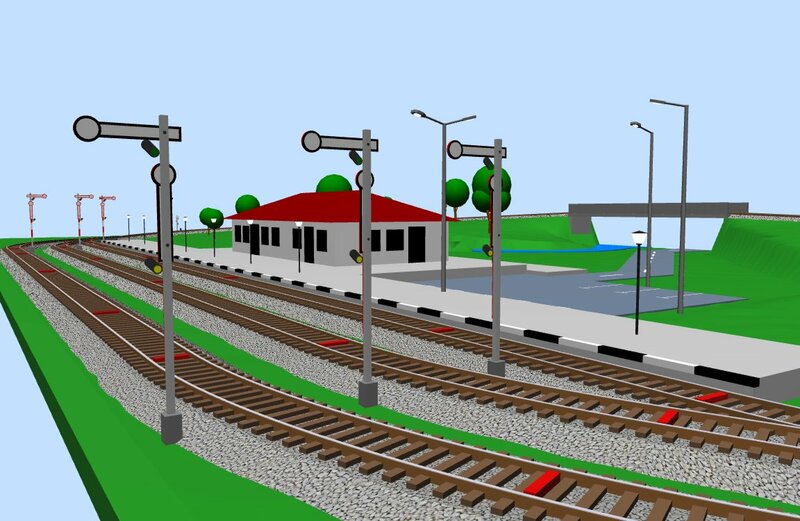 How to place railway signals? - Railway signals in SCARM are predefined objects in special object libraries, which can be selected like normal track libraries from library selection menu. The signals can exist in the library of specific manufacturer (in fixed scale) or can be universal (generic). Generic signals are useful in definition of your layout signaling when the real model signals are not available in the dedicated manufacturer’s library or when the real signals will be hand-made from you or other model railroading enthusiast. To start with signals, first select desired object library from library list – the object libraries are located in the submenu, named "Objects" (last but one item in the libraries menu). Zoom in to the area, where you wish to place the signal. Select the needed signal from the selection panel – the signal will appear in the centre of the screen. If the library is generic, the signal will be scaled to the scale of the last used track library. Select the object on screen with the mouse and then use "Objects" > "Rotate" from the menu in order to turn the signal at desired direction along the track. Hold Ctrl and move the object with mouse at desired position. When ready, you can see how the signal will look on the layout by clicking "3D" button from the toolbar. Note: Only few base signals in some railway administrations in the world are available at the moment. More signal libraries will come soon. How to use the Toolbox? - The Toolbox in SCARM is a small helper window, which can stay open and always on top, intended to help creation, design and precise placement of the different elements on the drawing plot. Use "Tools" > "Toolbox" menu to activate the Toolbox and then select a tool from the drop-down list inside. A short description of the different functions is following below. Start point: Intended for precise positioning of the start point. Enter the coordinates in X and Y fields, direction angle in A field and press "Place" button. Baseboard (rectangular): Intended to create a baseboard with rectangular shape. Enter lengths of the sides in A and B fields and press "Done" button. Flex-tracks modelling: Intended for precise shaping of flex-tracks by entering the parameters of each section. The modelling of the sections can be performed both with mouse and from the Toolbox. Start with choice and placement of the desired flex-track from the tracks selection panel. The flex-track will follow the cursor, while you are moving the mouse on the drawing plot – don’t worry about this. To add a straight section, enter desired length in L field and press "+ Straight" button. To add a curved section, enter desired radius in R field and curvature angle in A field, then press "+ Curve" button. If the radius you entered is smaller than minimal for the given flex-track, the section will be added with the minimal possible radius. Positive angle gives right curve, while negative is used for left curve from the current direction. If the last added section is not suitable, you can delete it by pressing of the small red [-] button. When flex-track shape is ready, press "Fix" button. If the last added section is longer than remaining flex-track length, the track will be fixed automatically. How to check size and area of the layout? - Toggle "View" > "Show size and area" from menu bar. How to change the track library? - Click with right mouse button over the name of currently selected library (located on top of the track selection panel) - a list with libraries will appear. How to get details for the selected library? - Move the mouse pointer over the name of currently selected library - a balloon hint with properties of the active library will appear. I can't find particular track system in the libraries? - Available libraries are described here. A library marked as "new" needs to be downloaded, unzipped and .lib file to be placed into Lib folder of the program in order to be available for using. The author will be very thankful for any information or updates about track producers and their track system dimensions and geometry. I can't find particular track in the tracks selection panel? - Scroll the tracks in the panel using the mouse wheel, because some of the tracks may be located outside of the visible area. It is possible that the searched track is not included in the library (for example, if it is new track or if it is missed by the author). There are missing accessories for selected track or turnout? - At the moment only a few accessories are included in some of the libraries. This process requires a lot of work and will take some time, until all of the libraries are fulfilled with all possible accessories. How to see a list of used parts? - Select "Tools" > "Parts list" from the menu. The list will appear in default browser from where it can be saved or printed. Note: Projects, created and saved with versions prior to 0.6.0 do not contain information about tracks scale and producer. How to print designed layout? - Printing with SCARM is easy – see the possible ways below. If you wish to print the whole layout, just press "Print" button from the toolbar – the program will automatically fit the track route onto the page and will print it on the default printer. If you want to see the page with your railroad layout before printing, press "Print Preview" button from the toolbar – this will activate Print Preview mode. If you wish to print given part from the track route, make sure that Print Preview mode is active ("View" > "Show as Print Preview" must be checked), move and/or resize the drawing to get desired layout part into view and then press "Print" button - SCARM will print the page exactly as it is viewed on the screen. Remember that you can edit your project and make all other things no matter whether you are working in normal mode or in Print Preview mode. If you make changes while working in Print Preview mode, so layout orientation is no longer optimal, toggle off and then on again "View" > "Show as Print Preview" – SCARM will set the page orientation according to current layout orientation. Press "Fit to Page" button from the toolbar if you wish to fit the layout on the page. Actually, switching off and on the "Print Preview" button does the same thing for you. If you wish precise control over the printing process, select "File" > "Print" and set desired options in the print dialog box. 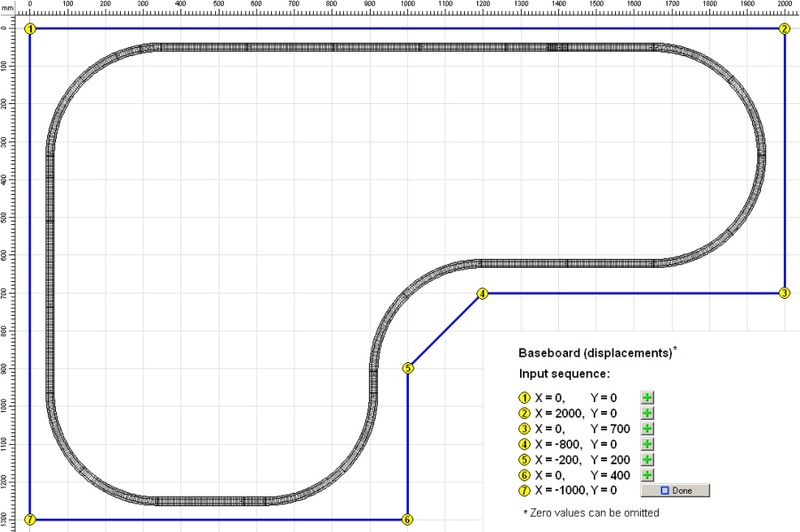 Note: If the layout has a baseboard and there are tracks outside baseboard contours, those tracks will not be taken into account when SCARM calculates layout position and size in the printable area. Can I use SCARM from portable memory devices? - Yes, you can run SCARM from portable devices, such as USB memory sticks. In order to do that, copy the installation folder of the program (by default it is C:\Program Files\SCARM) to the desired removable memory device and run scarm.exe from that device. Then open "Tools" > "Settings" and navigate to "Portable" page in the Settings dialog. Press "Save Settings locally" button and confirm the folder, copied on the portable device. Now, when SCARM is launched from the portable device, it will remember its settings on that device. Are there versions of SCARM for Mac or Linux? - No. SCARM is available only for Windows. I can't find the answer of my question? - Contact the author at . Always check for recently discovered issues and solutions for them in Problems & Solutions section of SCARM Blog. Empty snapshots in 3D viewing mode – Due to some incompatibility between 3D rendering engine of SCARM and some graphic cards/drivers, it is possible your 3D snapshot files to be empty. Possible workaround: select "View" > "Full Screen" from the menu when in 3D viewing mode and then press "Print Screen" (PrScr) button on the keyboard - the scene will be copied in the clipboard. Press Esc to return into normal screen. Open some graphic editor (like MS Paint), paste the screen and save it to file. Nonworking 3D Viewer on SiS Mirage based videocards – When you try to open the 3D viewer, the program shows empty or corrupted window, displays an error message or crashes. The author is working to solve the problem. Remember, that SCARM is still in beta stage of development and sometimes may not work as expected. Always create archives of your layouts and save changes in the files with incremental names (just in case) i.e. “layout_1.scarm”, “layout_2.scarm”, and so on. Please report any bugs and error messages with explanation how, when and where in the program they occurs to author at . (C) 2010-2014 by Milen Peev a.k.a. Mixy. All rights reserved. Use at your own risk!